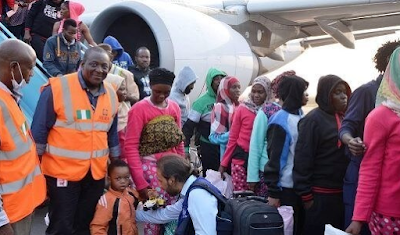 Eight days after 149 Nigerians voluntarily returned from Libya, another batch of 258 on Tuesday came back home from the North African country where they had been stranded on their way to Europe. The returnees were brought back aboard a Libyan Airlines aircraft with Registration Number 5A-LAU. The Airbus 330-200 aircraft touched down at the Cargo Wing of the Murtala Muhammed International Airport, Lagos at about 8.45pm. The returnees, who were assisted back to Nigeria by the International Organisation for Migration (IOM), comprised of 238 female adults, seven teenage girls and one infant, while the male were seven adults, two teenage boys and three baby boys. Also, 149 Nigerians had on November 6 returned from Libya bringing the total of returnees who arrived the country within the last five weeks to 975.